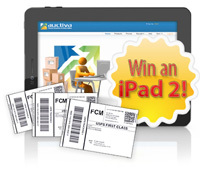 Auctiva is so eager for users to try its new Integrated Shipping Labels feature, it is giving away a fully loaded iPad 2 with Wi-Fi and 3G capability to one lucky eBay seller as part of a promotion. Through October 31, U.S.-based eBay sellers who print a shipping label on Auctiva.com will be instantly entered in a random drawing to take place next month. Auctiva's Integrated Shipping Labels lets eBay sellers buy and print USPS shipping labels, including First Class International, right from their Auctiva accounts, with no need to subscribe to a shipping service. Anyone with an Auctiva account can use Integrated Shipping Labels, including customers on the Free Tools plan and those who are in their 30-day free trial. The promotion is void in Florida, see contest rules on the Auctiva website.